My graduate biophysics class has also been exploring the microscopic-scale physics of diffusion and flow. This week, we’ll get to the “low Reynolds number” issues reflected in the Physics Slam talk. Last week, we explored among other things the very non-intuitive ways in which diffusion-to-capture works. For example: Imagine a bacterium covered with “sticky” patches (receptors for nutrients, for example). The nutrients dissolved in the bacterium’s surroundings diffuse and, by chance, hit the patches, where they’re absorbed and “eaten.” Each patch is small, — say, 1 nm in radius like a typical protein — compared to the roughly 1 micron radius of the bacterium. 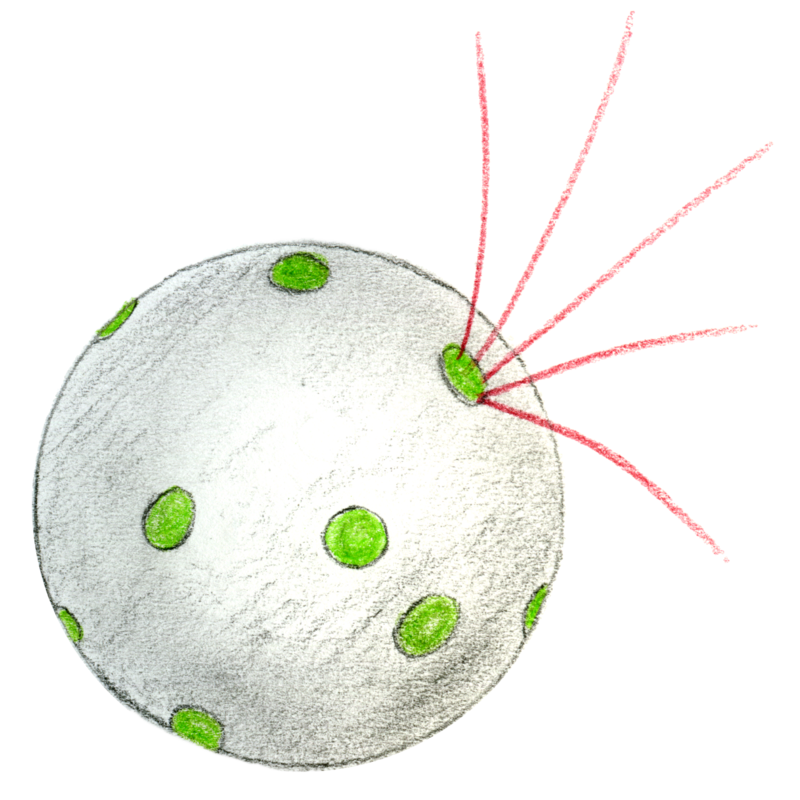 The bacterium could cover itself entirely with adsorbing patches and maximize its food uptake, but it wouldn’t have any surface left for any other tasks — motility, secretion, sensing, etc. — so this would not be a good strategy to adopt. 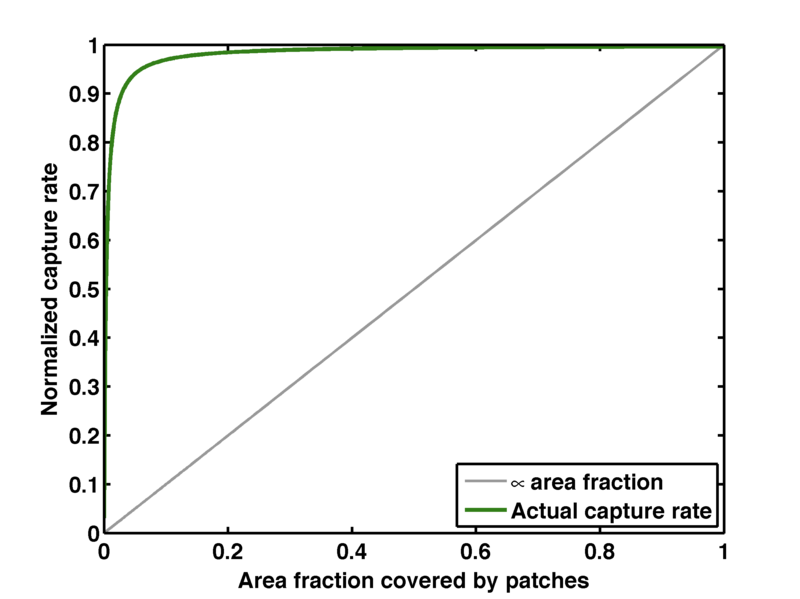 We, or the microbe, can ask: What fraction of the surface needs to be covered in absorbing patches for the total food uptake to be half as large as it would be if the entire surface were “sticky?” Naively, one might expect the answer to this to be 0.5 — half the surface should give half the food uptake. This is, however, totally wrong. Remarkably, one needs only about 0.3% of the surface to be “sticky” to provide a 50% efficiency for diffusive food capture. This remarkable result follows from the properties of diffusion. A simple derivation can be found in Howard Berg’s classic “Random Walks in Biology.” We can get a rough intuitive sense of how it arises by realizing that diffusive flows are driven by gradients of concentration. 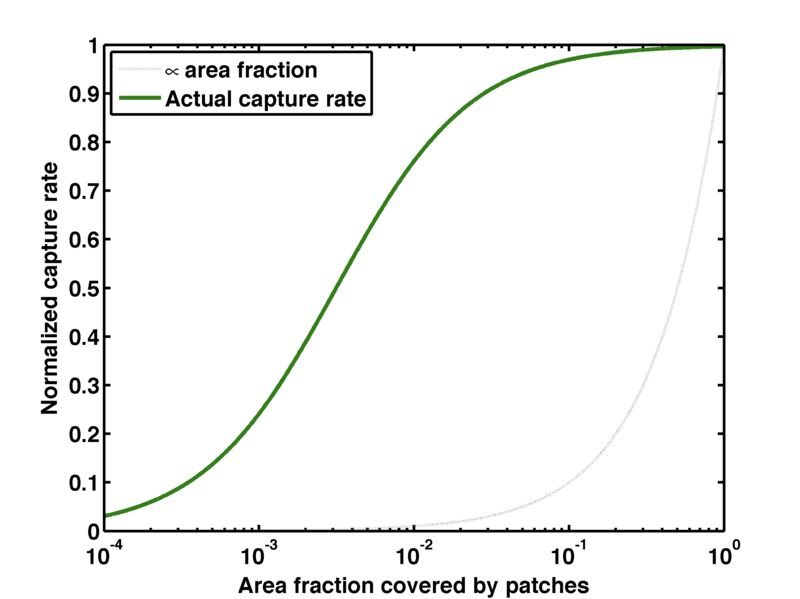 If we halve the radius of an absorbing patch, its area drops by a factor of four. However, the average flow lines of the diffusing particles, which must end at the patches, are squeezed into a tighter space, increasing the concentration gradient and thereby giving a greater flow rate that partially counteracts the large drop in area. This is both amazing and, for bacteria, extremely useful. A handful of receptors are sufficient to to efficiently capture molecules from the surroundings, so there’s plenty of room for many types of receptors for many types of molecules (various nutrients, attractants, repellents, etc.). The physics of the microscopic world are endlessly fascinating. 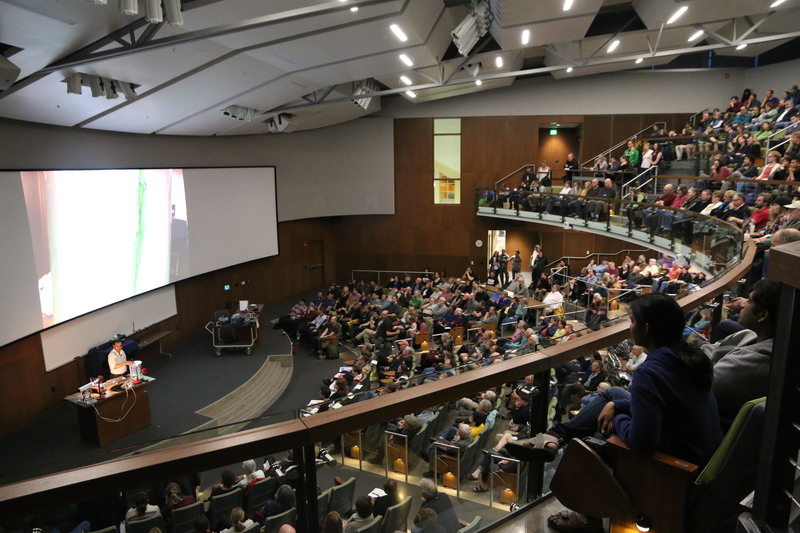 Returning to the Physics Slam: As five of us predicted with high certainty beforehand, our astronomer Scott Fisher won — he started off with an astronomically-modified version of the intro to Prince’s Let’s Go Crazy, complete with music. Plus there were photos of colorful space things. The rest of us didn’t stand a chance. Next Next post: How much is that physics major in the window?